Contact Michael or Tim if you would like to see this show (as it is sold out) and we will add your name to the waiting list for returns. Please provide your best contact telephone number or contact details. Throughout 2017 Dillie will take a short break from her Fascinating Aïda gal pals to present her first solo show in 558 years. 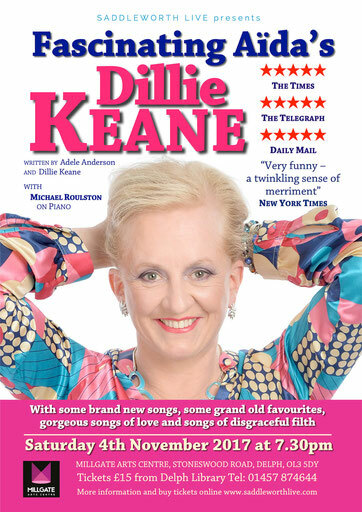 With some brand new songs, some grand old favourites, gorgeous songs of love and songs of disgraceful filth, Dillie will break your heart, mend it again and have it sent to the cleaners for pressing. And she’ll give you her recipe for chutney while she’s at it. Dillie will be accompanied on the piano by the very talented Michael Roulston. This show was a huge hit off Broadway during its month-long run and was nominated for a New York critics' DRAMA DESK AWARD.